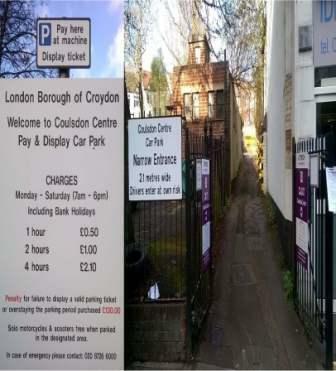 As you may know ECRA and the othr RAs have been lobbying the Council to – first of all not to take away the one hour free parking in Coulsdon, replacing with 30 minutes free and 30 minutes paid for. We also lobbied for a second hour after the one hour free paid for to accommodate those who need longer than one hour for such things as Physio and Dental appointments, hairdressers, etc. This would still allow for a turnover of vehicles. Councillor King made the decision to re-introduce one hour free parking in Croydon’s District Centres including Coulsdon, for confirmation at the TMAC. This reverses the decision to remove said one hour free parking and replace with 30 minutes free and 30 minutes paid for taken by a previous TMAC and Chair. The re-introductions of the one hour free was confirmed at the TMAC on the 8th February for introduction in July. Although we asked that the one hour free should be in the whole of the CPZ of Brighton Road and Chipstead Valley Road it is likely that the decision may only return the one hour free to Brighton Road. Councillor King says he has sympathy with the second hour paid for and has asked for further, wider input on this idea and in consultation with cabinet colleagues agreed to refer the suggestions to one hour free and a second hour paid for to the Council’s recently established Small Business Commission in part of the Brighton Road. Representative from small and medium sized enterprises (SMEs) in Croydon are being invited to share their views on how the Council can support companies in becoming more successful. 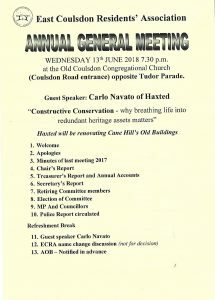 ECRA and the other RAs are continuing to push for as much parking as possible within Coulsdon. The 20 MPH speed limit is no in place for the whole of Croydon in designated roads. There are conflicting views on the benefits and problems with 20 mph – we should accept that different people have different views and priorities. ECRA’s view has always been that we support 20MPH limits in individual roads were there is a clear safety case and/or the residents support them but not a blanket ban. We wrote to Croydon Council to object to the way the consultation was worded in that there was not a simple Yes/No option for are 5. TRAVEL WATCH REJECT THE PROPOSALS TO CLOSE BOOKING OFFICES BUT GTR/SOUTHERN HAVE ALREADY PUT IN REVISED PROPOSALS. Hopefully this is the end of the threat to close the ticket offices at Coulsdon and Purley and other Croydon Stations. However, ECRA, Croydon RAs and East Surrey Transport Committee will keep and eye out for any future threat which may arise in the future. The stations listed below will have a Host on duty for times significantly in excess of the current ticket office hours. The Host will provide assistance with ticket purchases, information provision and assisted travel at the times shown within the station concourse or gateline areas. These times are the minimum hours that the Host will be available. The Host will have a hand held ticketing system that will enable them to provide tickets that are not available from the self-service machines. The Ticket Office at these stations will be open in the morning peak hours to ensure that passenger’s needs for tickets are met at these busy times (the proposed opening times of the ticket offices are shown below). The primary point for purchasing tickets on the station will be from the self-service machines, from the Station Host or at morning peak time through the ticket office. The Station Host will also have access to a ticket office machine within the concourse area, on a Hosted Point, to enable ticket types, not available through self-service or the hand held machine, to be issued. Each of the stations listed will have a member of staff on duty from the first train of the day until the last train has departed, 7 days a week. The Ticket Office at these stations will be closed and the primary point for purchasing tickets on the station will be from the self-service machines or from the Station Host. In the event that a ticket type is not available through these machines then the Host will have access to a ticket office machine within the concourse area, on a Hosted Point, to enable those ticket types to be issued, or within the ticket office where space in the concourse is limited. The stations Hosting Point will continue to comply with the regulations and stipulations within Schedule 17 of the Ticketing and Settlement Agreement. Each of the stations listed will have a member of staff on duty from the first train of the day until the last train has departed, 7 days a week. We wish to thank all those who protested we may ask again in the future once the issues have been studied. The CCCG can – occasionally – change (or partially change) their minds!! As you may be aware, the successful warfarin service which was held at Old Coulsdon Medical Practice (OCMP) was removed by the Croydon Clinical Commissioning Group without consultation or notice and the service and the contract was awarded to Boots in their stores via the pharmacists. Chris Philp MP received a letter from the CCCG which confirms that Boots are now seeing patients at Old Coulsdon Medical Practice so, should this affect you or someone you know, please let them know that they should contact OCMP to find when the clinics are held. Please pass on if there are other you may know who could be affected by this change. As of the 19th November the CALAY Centre Car Park – with entrance via narrow entrance in Chipstead Valley Road is OPEN. If your car is less than 2.1 metres wide you will be able to use this car park – you may need to bring your wing mirrors in. A Planning Application for a new entrance from woodcote Grove Road has been submitted. Sutton and East Surrey Water Company to increase their reserve supplies of water they has obtained planning permission to construct a Storage Lagoon (reservoir) in the field between Lyndhurst Road and Rectory Lane. They have agreed to keep the local footpaths open during construction which will take up to 3 years. However, the routes down which the construction traffic has been envisaged has Chipstead Valley Road as the main route. Coulsdon West RA, and othersn are in discussion on restricting the time when this traffic can use CVR, especially during the morning and late afternoon / evening during the rush hours on this very constricted road. Oasis Byron School has developed from a struggling school to where they are now, on the cusp of outstanding. But they are still not attracting as many local children as they would like. Please see the posters below and support if this is approriate for you. Danny’s Fish & Chip Shop in Old Coulsdon, Tudor Parade, battered the opposition to sine the contest run by Proctor and Gamble. 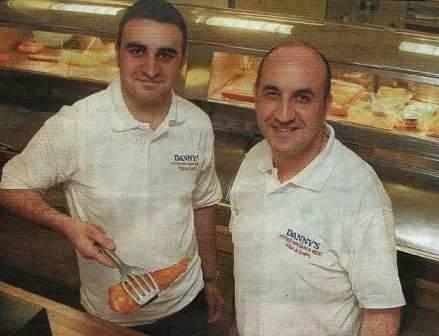 Danny is often found singing to his customers and says they just buy the best of everything and don’t cut corners on quality. Once they have found a good supplier they go back. They won by getting the most votes by the public. Danny, his wife Nursen and son Anil wish to thank all those who voted for them to enable them to win, as do his father and mother who started the business 40 years ago. The ECRA Facebook page is now up and running. If you’re on Facebook, please “like” the page so we can get some traffic to and from and start to make it a bit more useful and interesting. You’ll see I’ve added some basic info, but feel free to add more. Anyone can view the page, you don’t need to be signed up, but you will need to sign up if you want to add anything to it. Coulsdon – the most desirable place to live in London! Parts of the East Coulsdon RA’s area (including parts of West Coulsdon) are ranked as the 132nd most desirable place to live in the UK, out of over 7100 locations. It appears that this may be the highest rated location in Greater London! 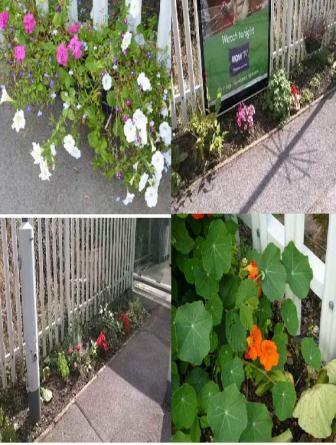 Here are some examples where we have put forward the views of our residents’ with positive outcome. Engaged with local developers, . Improved train service at CoulsdonSouth & CoulsdonTown. Increased parking at Coulsdon South station. Improved bus service on routes 405 and 434. Lobbied Croydon over the need for more School places in Coulsdon. Supported Waitrose distribution centre in Ullswater Crescent with over 400 jobs. Road safety measures in a number of roads including Woodplace Lane. Repair of CoulsdonTown centre roads. Helped save the Bowling Green in Marlpit Lane. Increased number of residents’ parking bays. Engaged with Croydon Council in discussions on Coulsdon Town Centre and Cane Hill developments. We run a number of successful social functions each year as a way of ‘meeting your neighbour’. These include quiz nights and a Christmas Dinner Dance. However, we can only achieve these things on your behalf with your help. ECRA Committee has only eight members most of whom have been shouldering the burden of work for many years. Likewise, many of our Road Stewards have been active for many years and need to step down. WE NEED MORE VOLUNTEERS TO HELP DISTRIBUTE OUR QUARTERLY NEWSLETTER – THE REVIEW. More (up to fifteen in total) Committee members to share the tasks of supporting our community. Ten new Road Stewards to deliver the Review and collect subscriptions. The Committee cannot continue to double up on the vacant rounds. We also need understudies for all the tasks associated with producing The Review: editorial, advertisements, distribution. Please seriously consider volunteering your help so that ECRA can continue its good work. You are welcome to come to a Committee meeting before making a commitment. Over the last couple of years as part of their Flood prevention programme Thames Water constructed a number of retention tanks on the sewage system in Coulsdon. These tanks can fill at times of heavy usage or heavy rainfall which is more prominent these days and then discharge when the flow of sewage and rain water subsides. All these tanks have been very successful except for the one at the beginning of Reddown Road between Marlpit Lane and Fairdene Road. This tank has filled on a number of occasions, but failed to empty when the flow subsided and unfortunately this has affected a small number of properties in Reddown Road. This has resulted in the tank having to be emptied by Tanker to prevent flooding of sewage in houses in Reddown Road. Thames have visually inspected them and also inspected it with CCTV on a number of occasions and tell us that the internal flow control mechanism becomes jammed by a mixture of wet wipes, disposable nappies and coking fat. We are still in discussion with Thames Water to try to resolve this problem. 6. The minimum annual subscription shall be such as is recommended by the Executive Committee from time to time and approved by the Annual General Meeting, which shall cover all adult members of the same family unit resident at the same address. Subscriptions are due on 1st April in each year and payment thereof shall constitute membership “except those excluded under rule 5”.